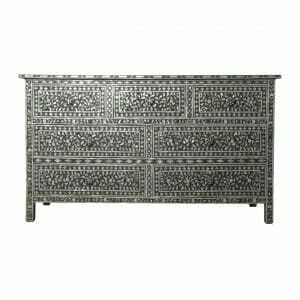 A beautiful addition to a living room, this Indian pearl makes a striking feature piece. 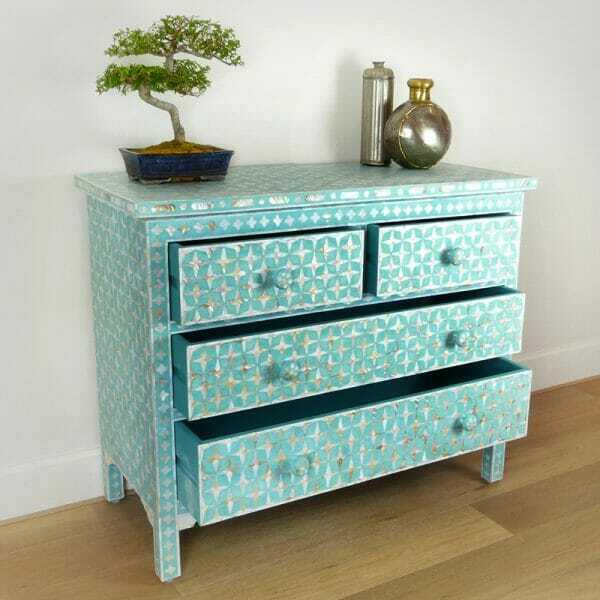 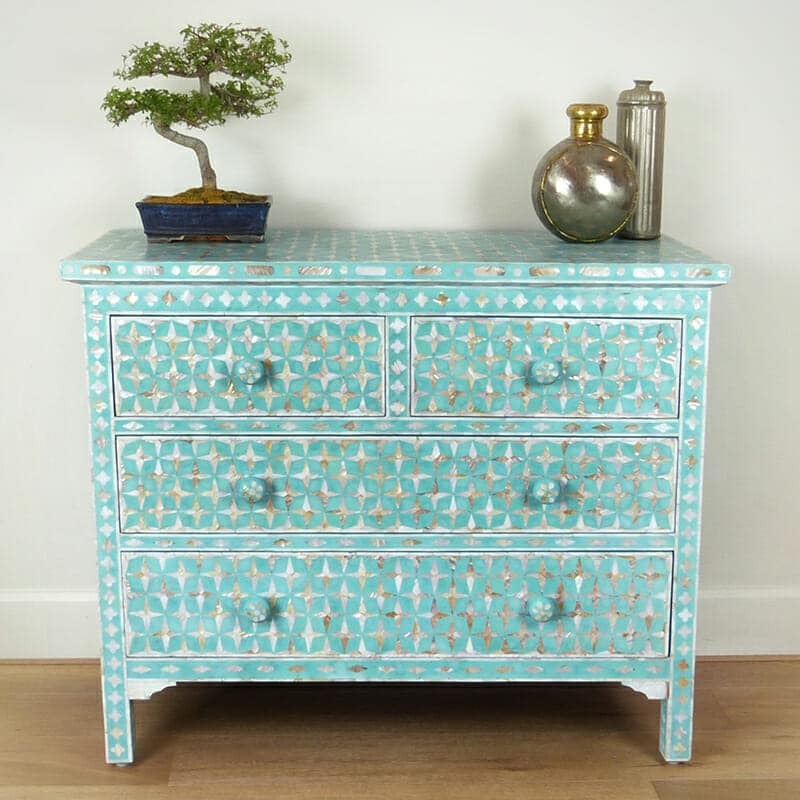 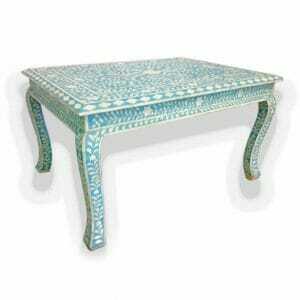 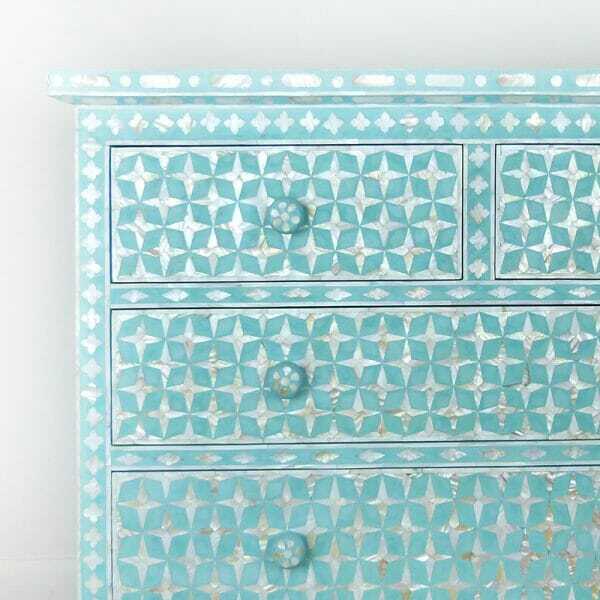 Working well with strong or soft colours, the Indian chest of drawers gives your home the quality of the orient in a fetching original turquoise star patterning. 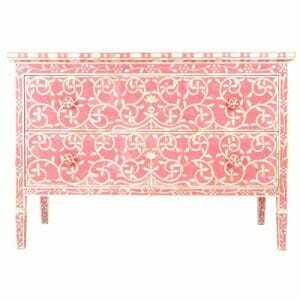 If you prefer to hoard your private treasure, you could adorn a bedroom with this blush of oceanic irridescence. 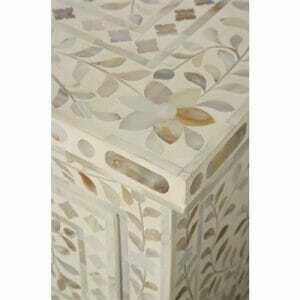 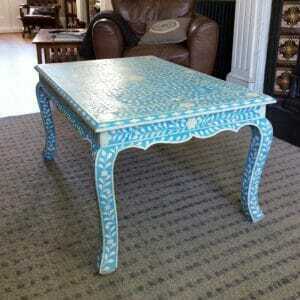 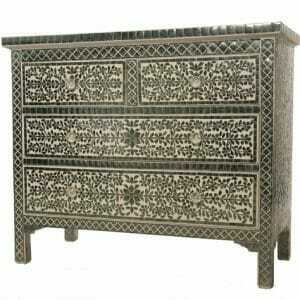 Mother of Pearl inlay adds lustre wherever it’s placed and there’s nowhere it doesn’t look good. 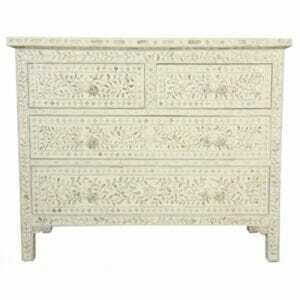 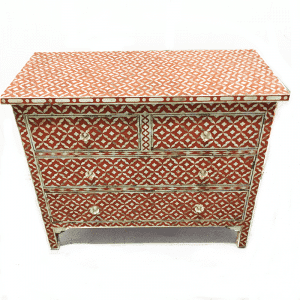 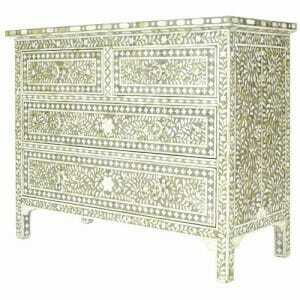 Effortlessly enliven a dull space or make a stunning one sparkle with this chest of drawers. 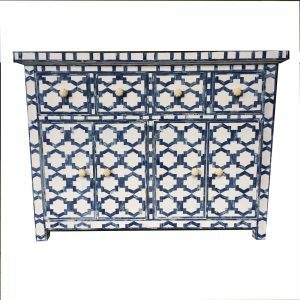 An oriental dresser with capacious inner dimensions, this inlay chest of drawers can safely house your precious linens and overflowing clothes piles, restoring neatness and order with generously deep storage space. 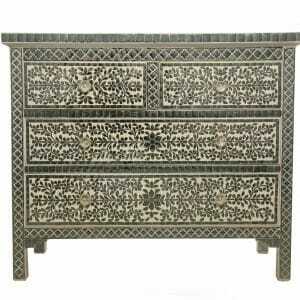 Deep enough for bulky items and awkward to house clutter, the inlay dresser is perfect for keeping any space tidy. 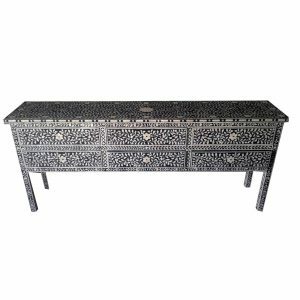 Weave a little extra magic with a matching mosaic mirror or a mother of pearl bedside table or maybe an Indian consol table. 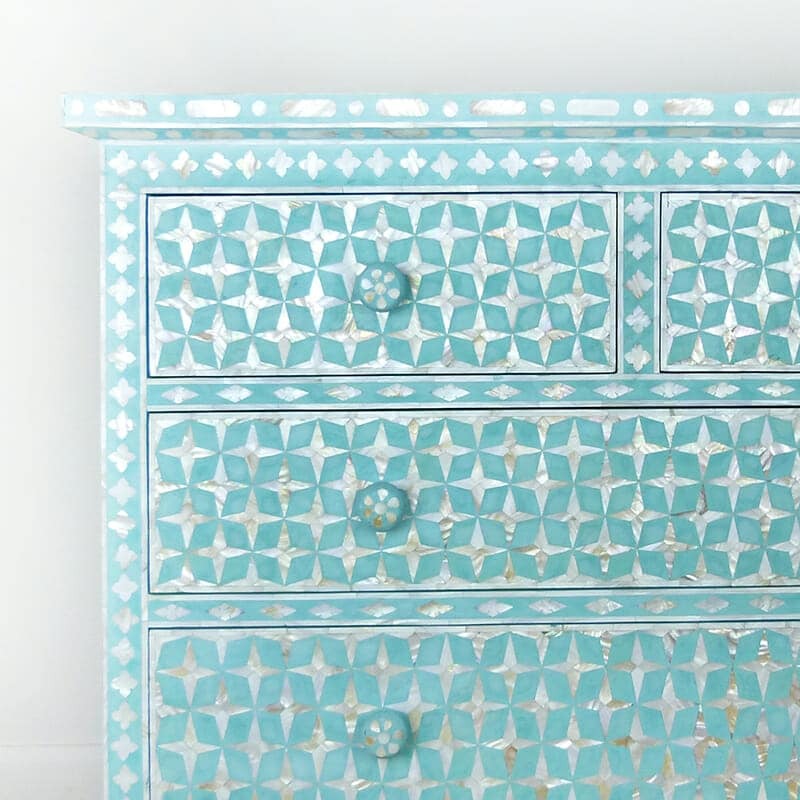 Prefer something specific? 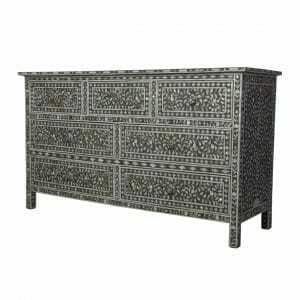 Your imagination is the limit and for no cost we can request your perfect Indian furniture piece in the colour and pattern of your choice. 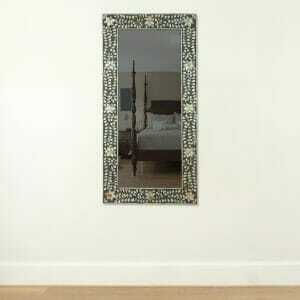 Just ask us for a no obligation quote. 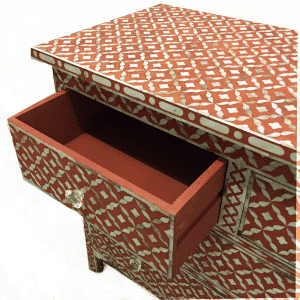 Our amazing colleagues in Rajasthan delight in producing unique pieces alongside established, traditional Rangoli designs and you may want to take a moment to peruse our other Indian furniture for ideas on pattern, shape and colour. 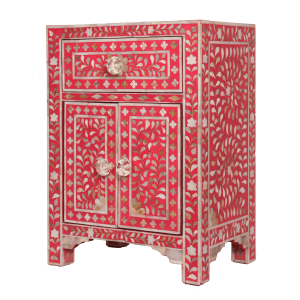 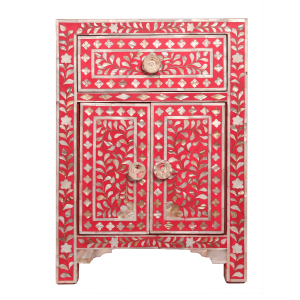 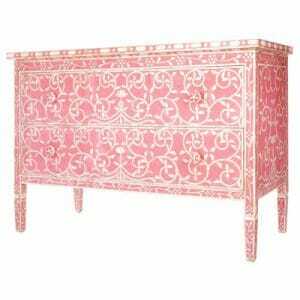 Would you like to know what goes into making an oriental chest of drawers or an Indian cupboard? 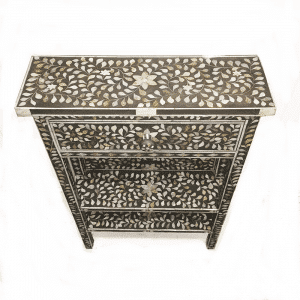 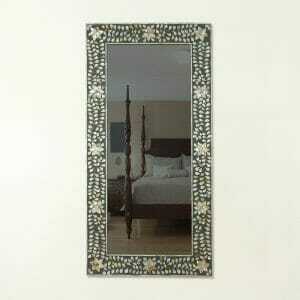 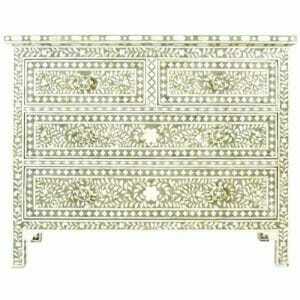 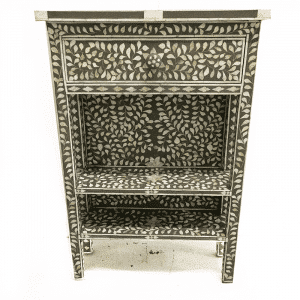 An inlay dresser or a mother of pearl mirror? 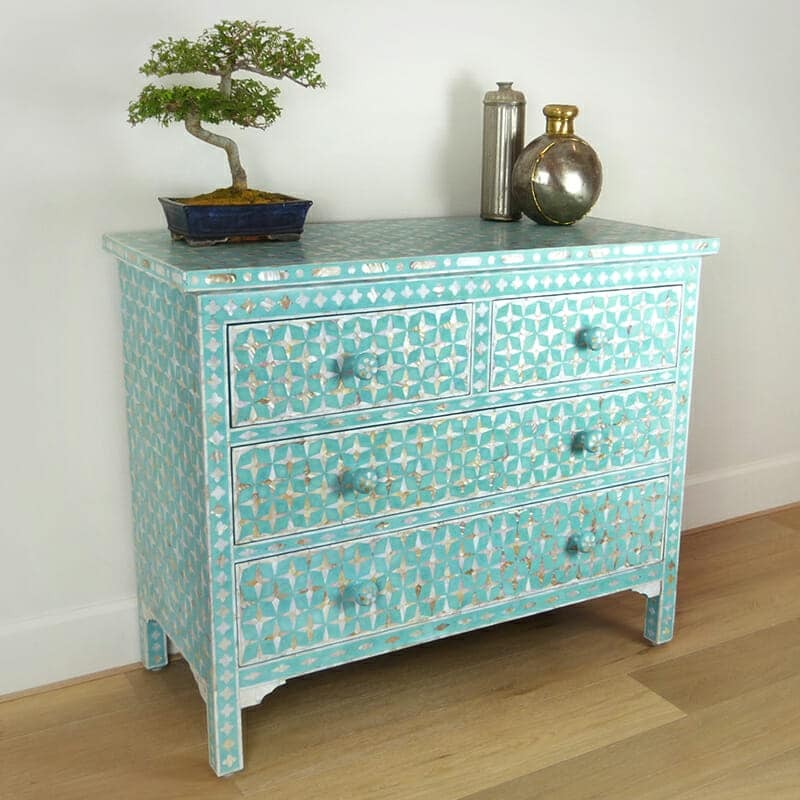 Apart from hours of meticulous hand crafted expertise, durable, solid and decay resistant hardwood cut from sustainably farmed trees gives the furniture a lossless quality, while we ourselves make sure the supplies that reach our artisans are ethically sourced. Mother of pearl and bone inlay pieces are hand harvested and hand cut before being inlaid into our stunning Indian rosewood or mango wood furniture. 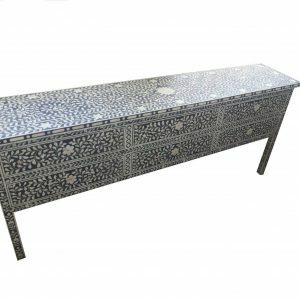 If you would like to order a piece on our website, please just go ahead and we will confirm expected delivery times with you. 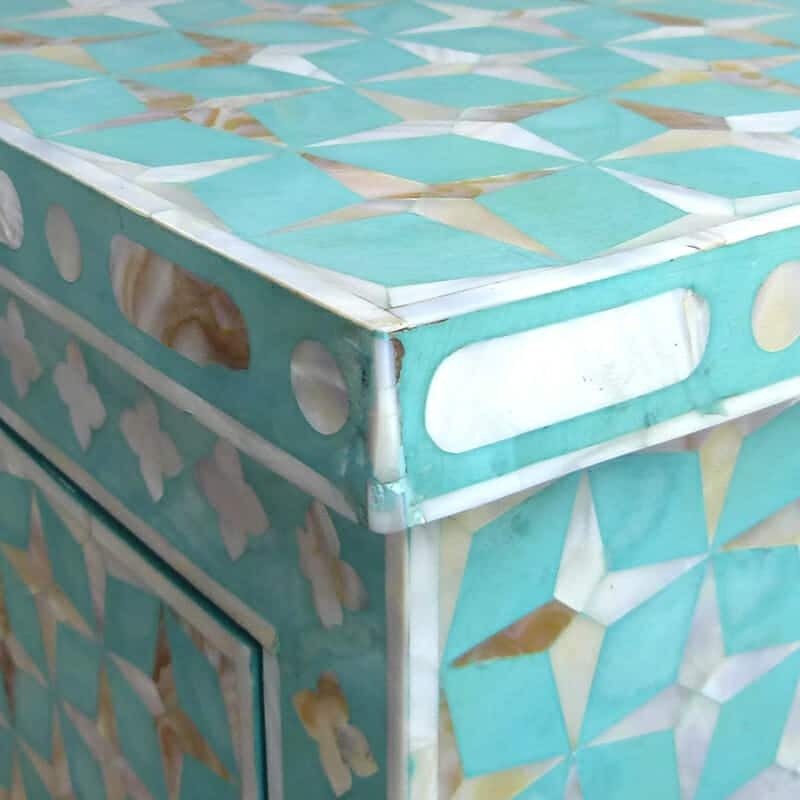 If however, you’d prefer a bespoke piece, just get in touch with us and we’ll let you know exactly what we can do, for a surprisingly reasonable quote.